If you have a musical passion and often tend to create your own music or edit some other melody especially that of electronic style, this app will undoubtedly win your heart. MixMeister scratch app for iPhone 3G and phone and iPod touch allows you to scratch any music you’d like from your iTunes library. 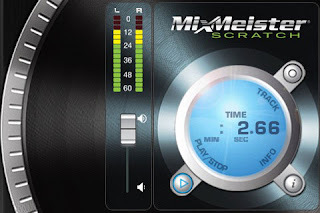 Certainly you won’t become a great mix master but this app will help you to look cool while hanging around with your friends. You’ll have a possibility to use ten different loops sound effects and tones for scratching any melody from your iTunes music library just for free. Before starting to scratch your favorite melody you must choose the appropriate sample that features looped hip-hop beats, turntable scratches, and tonal sound effects. On the virtual turntable that is located on the apps main screen you will find a scratchable area along with a timer and a volume control. You will be able to adjust the volume of the music in real time but the app won’t allow you to change the sample’s speed. The app is really cool for starting your scratching experiments and it’s available for free at the iPhone App Store.